The Westboro Baptist Church, infamous for picketing the funerals of soldiers killed in Iraq and Afghanistan is coming to New York. The focus of the tour will be "God Hates Jews." The Daily News reports as follows on the bizarre group's activities. "They're not in Kansas anymore. Topeka-based hate group Westboro Baptist Church is targeting Brooklyn Jews with a barrage of hate-filled demonstrations this week. "These guys are really sick; they're filled with hatred for Jews and a lot of other people," said Assemblyman Dov Hikind (D-Borough Park). "We have to make their lives miserable when they come to Brooklyn." The anti-Semitic, anti-gay organization plans to picket five synagogues in the borough Saturday, the day before Yom Kippur, the most important religious holiday for Jews. The group is on a four-day visit to New York, where they'll demonstrate at 19 locations, mostly synagogues, around the city and Long Island. They will start today at Brooklyn Tech High School in Fort Greene to bring their message to students. The group's members think the end of the world is coming, and frequently picket churches, temples and even funerals to try to spread their beliefs." What is most peculiar about the group is the predominance of anger and their singular focus on homosexuality. The group has a whole itinerary of synagogues in Brooklyn and Long Island where they will be demonstrating with graphic signs condemning homosexuals and during this upcoming tour, Jews as well. In the past, the WBC picketers,( almost all members of a single extended family) have met with spirited opposition. Even those who share their beliefs about biblical standards for intimate conduct feel embarrassed by the group and that its activities bring discredit to the very religion that they purport to espouse. As jarring and obnoxious as the group is, it is noteworthy that so small a percentage of America's Christian majority is involved in or condones the abusive and hateful conduct of the Westboro Baptist Church picketers. Christians in Egypt, Iraq and India are murdered. Their churches are sometimes burned down. The taunts of the WBC picketers and their disgusting behavior are mild by comparison. That is the anguish felt by a true prophet who dreaded delivering the words of rebuke for which he was renown. When I am admonished by someone close to me, and it is clear that there is pain in the person's voice, their words have a resonance with me. Smugness does not resonate with me. And I don't imagine it does much for most people. Those who promote scripturally sanctioned intimate conduct probably find that the smug hate of the Phelps family makes their work harder rather than easier. In a very real sense, the WBC people are putting stumbling blocks in front of the blind. which is about a month he spent with the Phelps family. It left me with feelings of pity for the Phelps family, especially the children who live in such a distorted environment. The documentary made it clear that there will be no shortage of people ready to shout back at the WBC picketers. This is, I suppose a sign of national health. 6 And HaShem G-d prepared a gourd, and made it to come up over Jonah, that it might be a shadow over his head, to deliver him from his evil. So Jonah was exceeding glad because of the gourd. 7 But G-d prepared a worm when the morning rose the next day, and it smote the gourd, that it withered. It should sadden anyone when a human being created in G-d's image dies either physically or spiritually. That is one of the themes in the Book of Jonah. I hope that the Phelps congregation comes to this understanding. There are Phelps family members who have left the fold. I hope that the hate that is spewed in G-d's name does not turn them into atheists. I wish them well in their new lives. 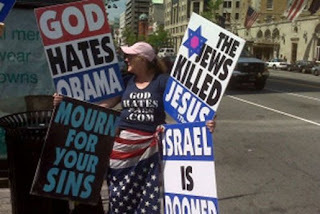 It speaks well for America that the Westboro Baptist Church remains a side show, a marginal phenomenon. The WBC should not become a tool in the hands of those who would marginalise people of faith in our age of cynicism. The overwhelming majority of Americans have done their part to make sure that this won't happen. Thank you and G-d bless America.